Cat Chat With Caren And Cody: What Have I Been Up To? Cody, you are so funny! At least it was fun for a moment. Cody would love to watch birdies more but we are on second floor and it is hard for him to see them. We had a bird nest on our balcony so that was the only way he was able to see them! Humans don't understand what a hardworking exhausting life cats have! MOL, burd watchin can be eggzaustin! oh I forgot the treats! I have treats a TON! MOL! LOL! 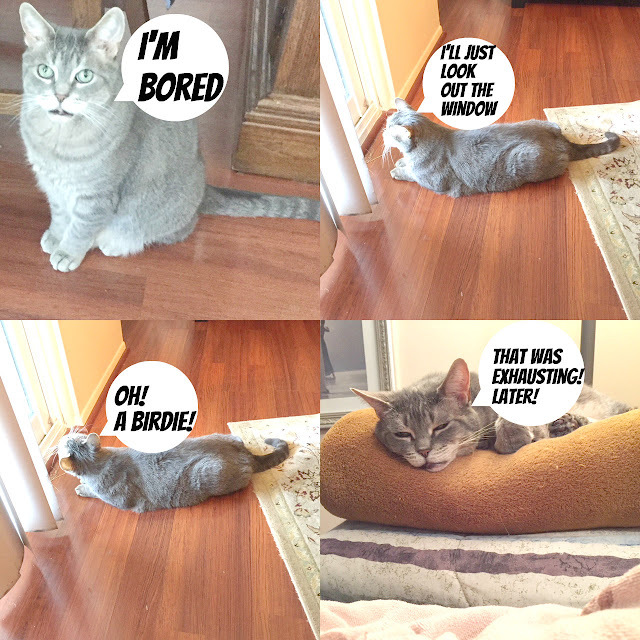 Well, all that bird watching IS exhausting, Cody! Happy napping! please give Derry and Nicki kisses from me and Mom too! Cat life...always revolves around lounging around! cause we are smart! Let the dogs work! Oh Cody, please don't overdo it pal! I'll do my best not to! Oh, you are one BUSY kitty! Hee hee, what a busy day you had, Cody!! MOL! I should come help Samantha with the chickies! A day in the life.... Around here it's an exhausting trek from one cat bed to another with frequent snack breaks. so nice to see you! Give Boomer kisses from us!! Cody, when I die, I want to come back as a cat in your house...okay? Awww that was sweet !!!!! My Mom is mean though MOL! Well done, Cody. That's just how it goes too. Thanks for the laugh Cody. Pretty much sums up "cats" attitudes. Lol. I wonder why this looks soooo familiar. Staring out windows and getting excited about birdies can be sooo exhausting. so nice to see you! You are so right! You need more exercise than just moving your eyes, Cody! HAHAHA....whatever you do, don't overwork it Cody! Sometimes lounging can be tiring. Get lots of snoozies and rest up for your next big lounge session. I wish I had a house so I could have a catio like you! I should come and play with Ernie and Wally! Stalkin' is hard work, right Cody? MOL!